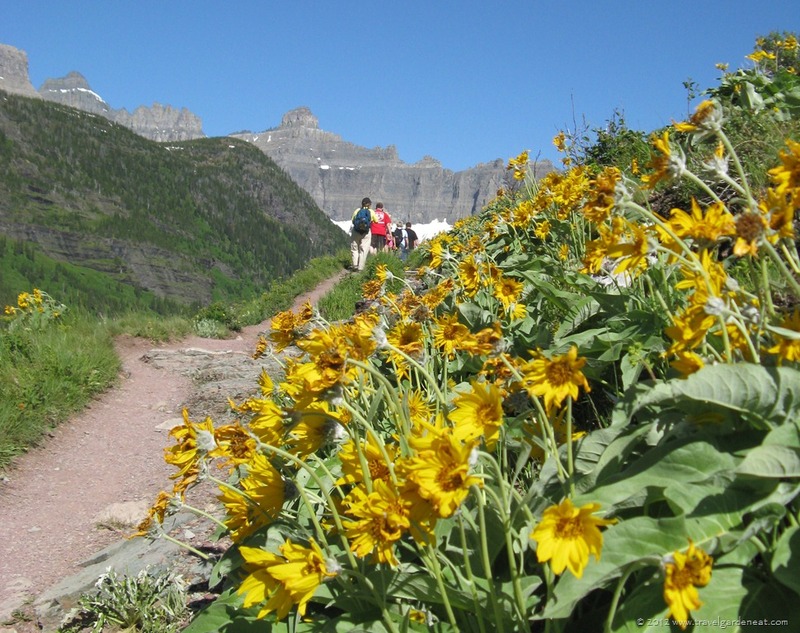 Glacier National Park – Travel. Garden. Eat. During this day of hope and renewal, nature speaks volumes, more than words ever will. 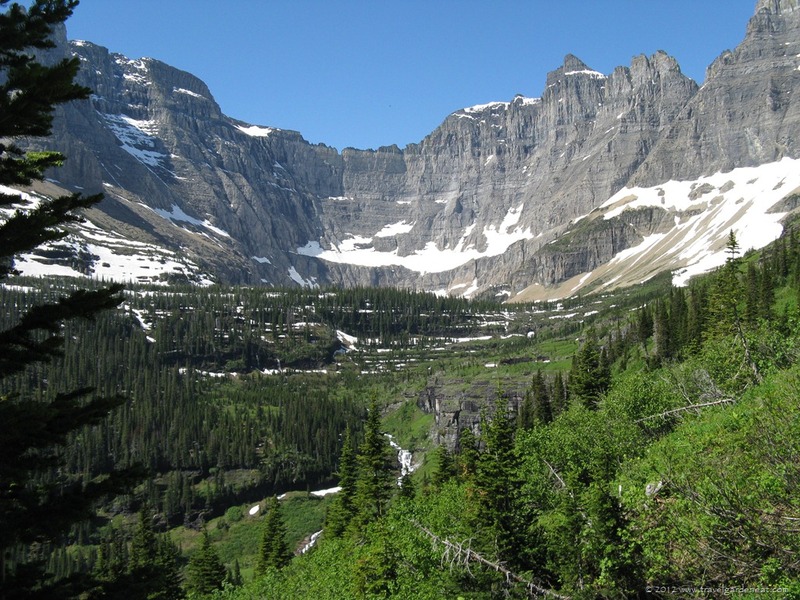 Pour a glass of wine, make a cup of tea, or just sit back for a few minutes and take in the beauty of Glacier National Park. Reflect on what this season means to you. Easter blessings to you — the faith and spirituality of Nature is universal and welcoming to everyone. 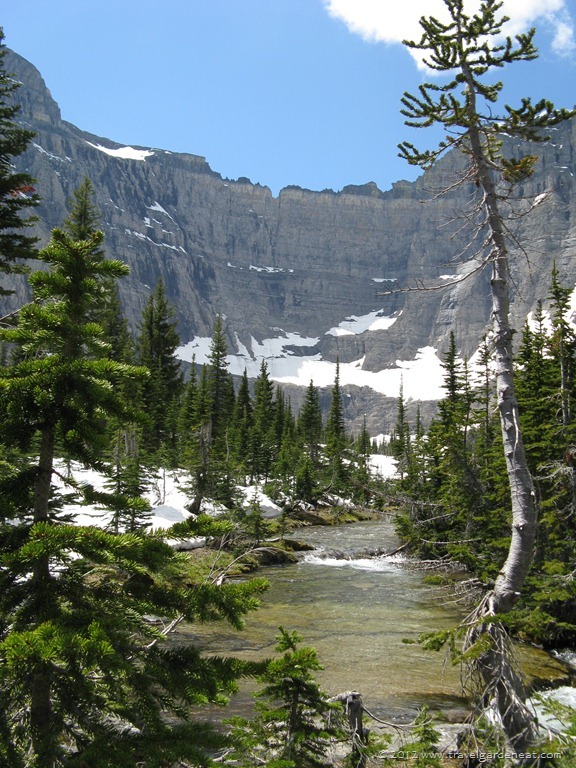 If you research campgrounds at Glacier National Park, as I did before we camped there several summers ago, the Many Glacier Campground on the eastern side of the Park is usually described as “one of the most popular” campgrounds in the Park. For me, phrases like that are usually a red flashing warning sign to run in the opposite direction. But, as we sketched out a rough itinerary for our week-long Montana road trip, I kept returning to Many Glacier Campground as the ideal spot to explore Glacier’s iconic scenery, including convenient access to the Iceberg Lake trail (which I wrote about in this post), and what seemed to be a large number of tent-friendly sites. 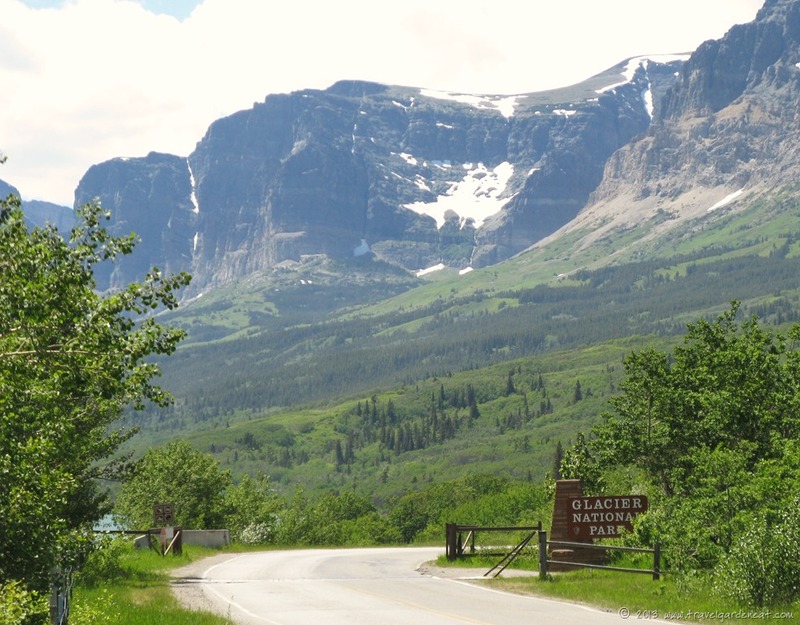 The drive into the Many Glacier section of the Park is beautiful, with Swiftcurrent Lake just down the road from the campground. 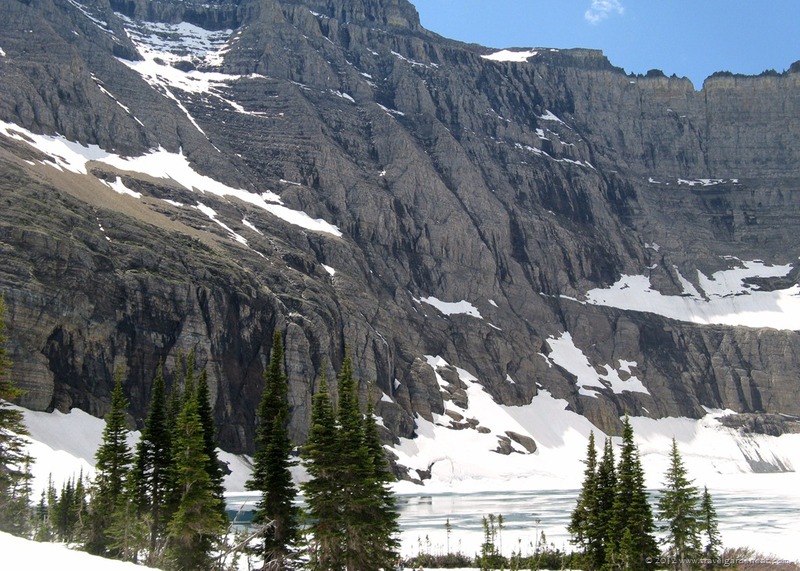 When the National Park Service has a chart of historical “fill times” for the campground, showing high season campground fill times of 8:00 a.m. on some days, you know that capturing a site at Many Glacier Campground is serious business. And, for you campers in the crowd, you know that just because there are some open sites, not everyone wants to have the spot immediately next to the entrance gate, nor does everyone desire to bask in the glow of the toilet building every evening. We were camping relatively early in Glacier’s season, at the end of June only a few days after the “Going-to-the-Sun-Road” was plowed through for the season (I promise a future post on that incredible drive!). Despite the fact that noon was approaching when we arrived, we were able to capture a cozy site nestled in the trees. The campground is adjacent to the Swiftcurrent Motor Inn, which provided token-operated showers for campers, as well as a cafe and gift shop (after a relatively warm 10-mile hike, the huckleberry ice cream at the gift shop was especially refreshing). 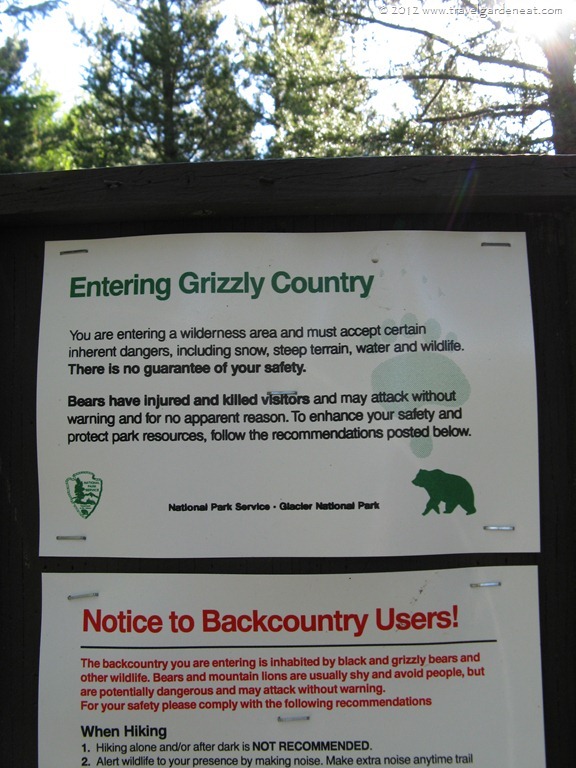 Because of the bear threat in the Park and campground, the rangers are militant about making sure campers have secured all food and other items that attract the bears. 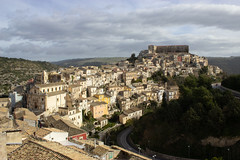 Coolers, cooking equipment, dry food goods — all had to be stored in your vehicle, day or night. On a warm day, this means the ice in the coolers melts quickly, which was another convenient aspect of having the the gift shop (which included a small grocery section) nearby — but not so close that we knew they were there while enjoying the campground itself! 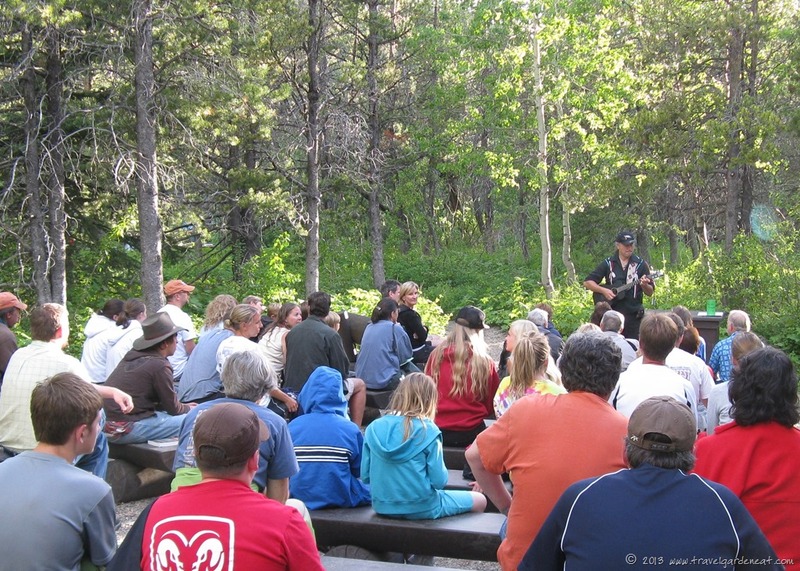 Many Glacier Campground had a wooded amphitheater where evening ranger talks and other programming occurred. We were lucky to have our stay coincide with a presentation of the “Native America Speaks” program, which usually takes place at the historic Many Glacier Hotel down the road from the campground, or at the St. Mary Visitor Center. Jack Gladstone is a Grammy-nominated singer/songwriter and a Blackfeet tribal member, who often performs as part of the Native America Speaks series. 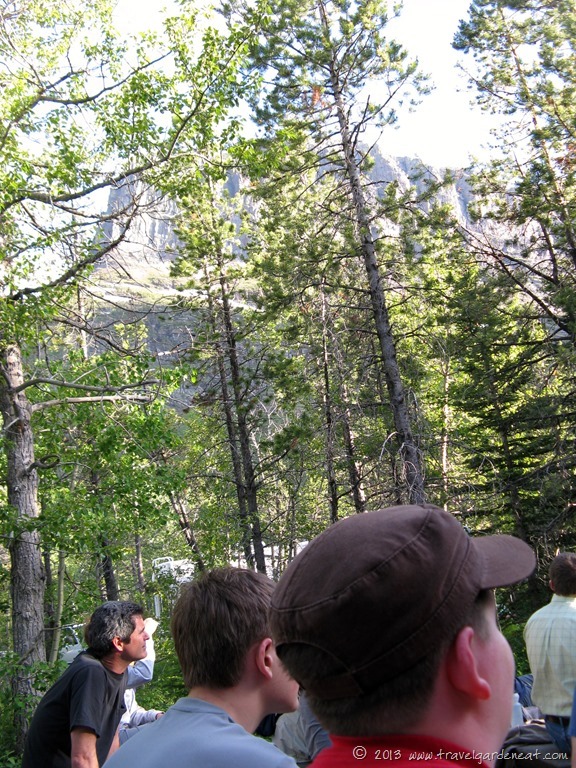 As we sat at the base of Grinnell Point, in the waning evening sunlight, we enjoyed listening to the legends of Glacier National Park and history of the Blackfeet tribe in music and words. A deer ambled through the woods on the edge of the amphitheater, pausing as if to listen with us. We bought two of Gladstone’s CD’s at the end of the program, and are reminded of the magic of Glacier National Park whenever we play them. The heart is the Sun’s beating drum. Where spirit and matter are one. And Legends of Glacier survive. We feel, but never quite know. The youngest of all of her children are us. Keep Legends of Glacier alive. 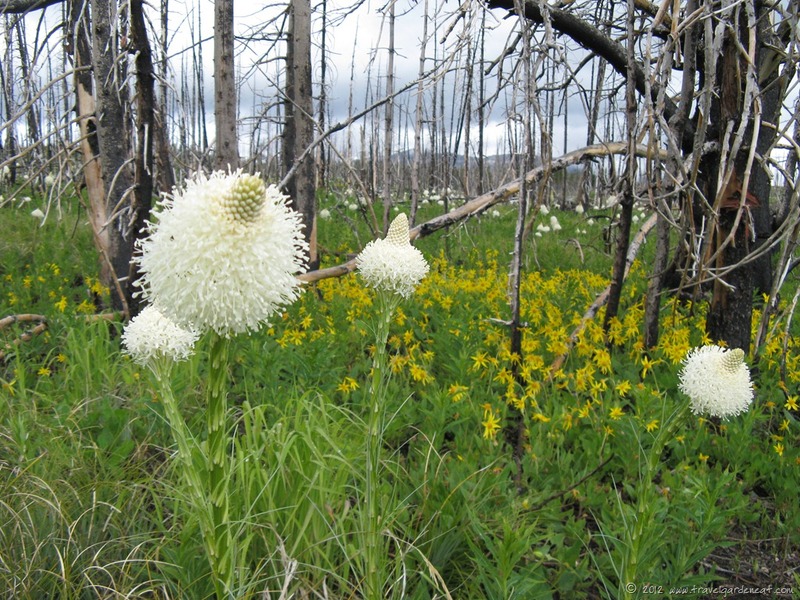 Living plant life emerging in a forest devastated by fire is nature’s renewal. 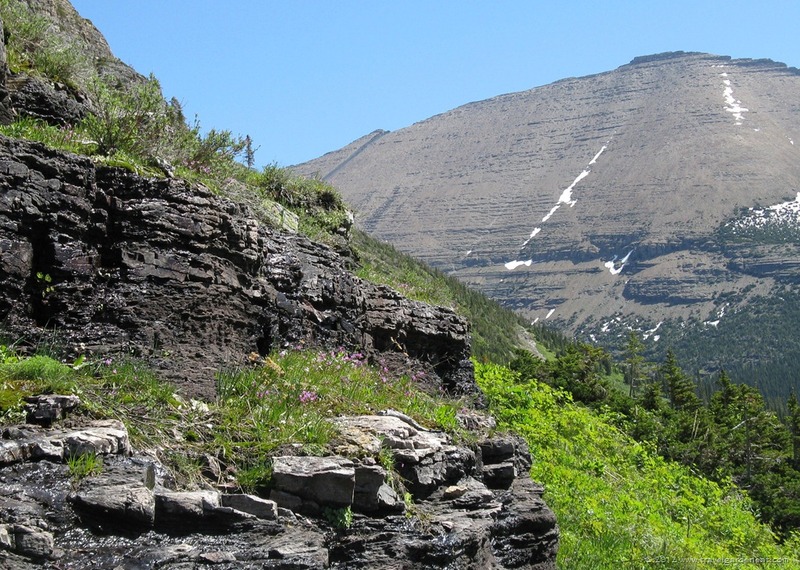 This photo was taken in the summer of 2010 near (or possibly still within) Glacier National Park in Montana. We spent several nights camping in the Park and were driving to Great Falls, Montana when I pulled off the highway to take this photograph. I have always enjoyed the contrast between the white beargrass and the stark forest surrounding them. It is a reminder of the resilience of our world. This post was in response to the Daily Post’s Weekly Photo Challenge, with this week’s theme of “Renewal.” Everyone is welcome to join in the Challenge, with further details on how to participate found here. I love blogging. It is the greatest procrastination tool ever invented. As I take a break before tackling the next item on the to-do list, I take a quick look at WordPress and read a few posts, reminding me that this diverse world of ours is made up of so many interesting folks. But, I digress, and I do need to get back to work, so shall we return to the topic at hand? 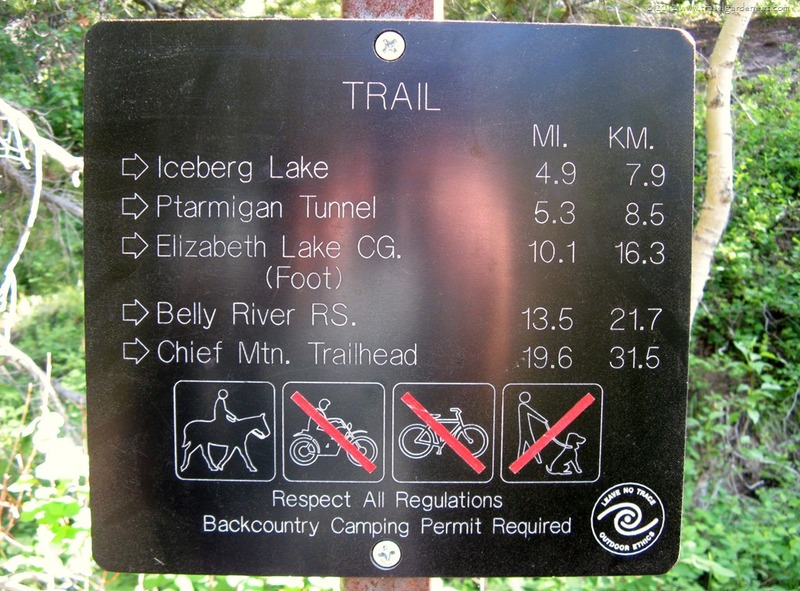 — Iceberg Lake Trail. We did not have time for a road trip this year, so as I view the lovely photos of hikes and stories about camping from blogs such as Travels with the Blonde Coyote, Canadian Hiking Photography, Backpacking Kids, Thirdeyemom, and Adventures in Kevin’s World, just to name a few, I reflect back on some of the great family vacation memories from over the years. This is why I love photos – they allow us to reflect back and remember some of the details the overcrowded, overworked brain may sometimes otherwise lose along the way. 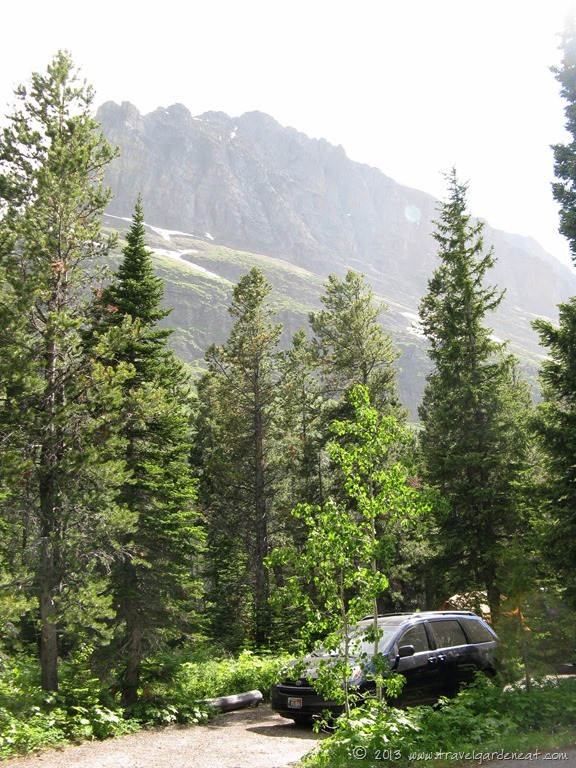 A couple of summers ago, we camped at Many Glacier Campground on the eastern side of Glacier National Park. Lovely campground. 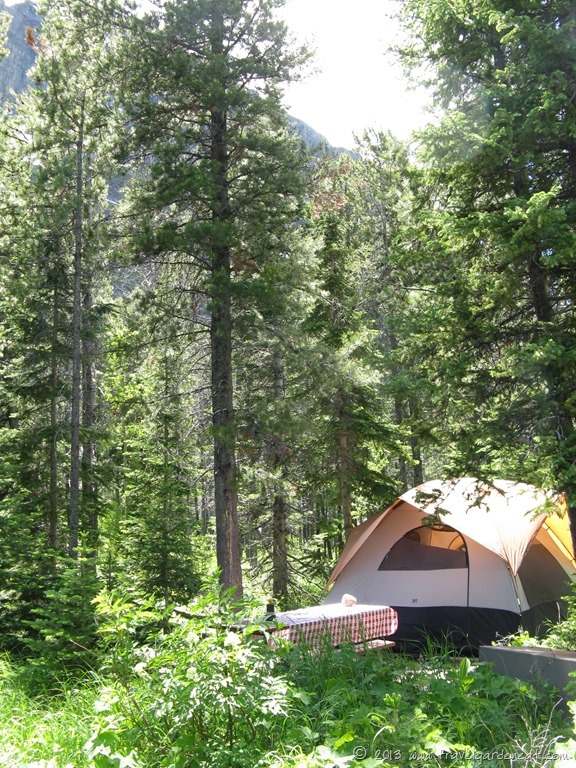 I will be sure to write a future post about why this popular campground is worth exploring. 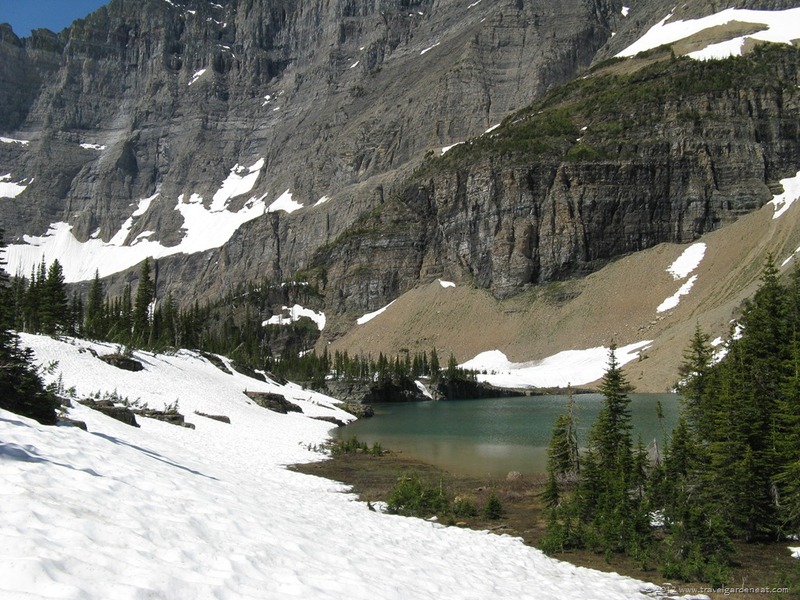 Logically, I could have started at the beginning of our Glacier road trip, but the Iceberg Lake hike was one of my favorite memories from the Park, and since this is my blog, that is where the Glacier National Park trip story begins. We decided to join one of the Park’s naturalists as he led a small group of visitors on the almost five-mile trek to Iceberg Lake (leaving us to wander back the return five miles on our own). Because it is one of the Park’s more popular trails, we were unlikely to find ourselves on the trail alone anyway. The Park naturalist provided some interesting narrative and insights into the flora and fauna (or at least the signs of fauna – such as bear fur on a tree, which was all the closer I needed to be to a grizzly on the trail) as we hiked along at a leisurely pace, allowing plenty of time for me to grab some shots of the scenery. One of the flora the naturalist pointed out was the beargrass blooming throughout the Park. 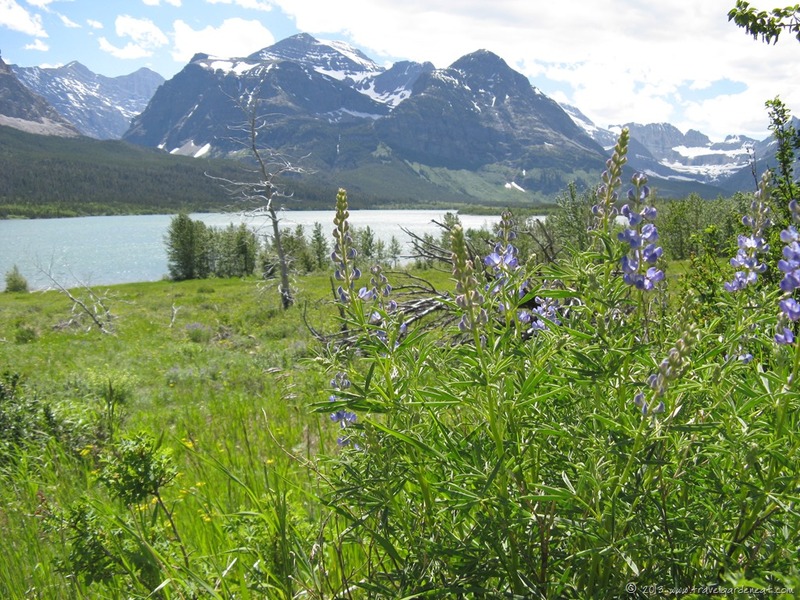 The website “Discovering Lewis & Clark” quotes Meriwether Lewis as writing in June 1806, “There is a great abundance of a species of bear-grass which grows on every part of these mountains. 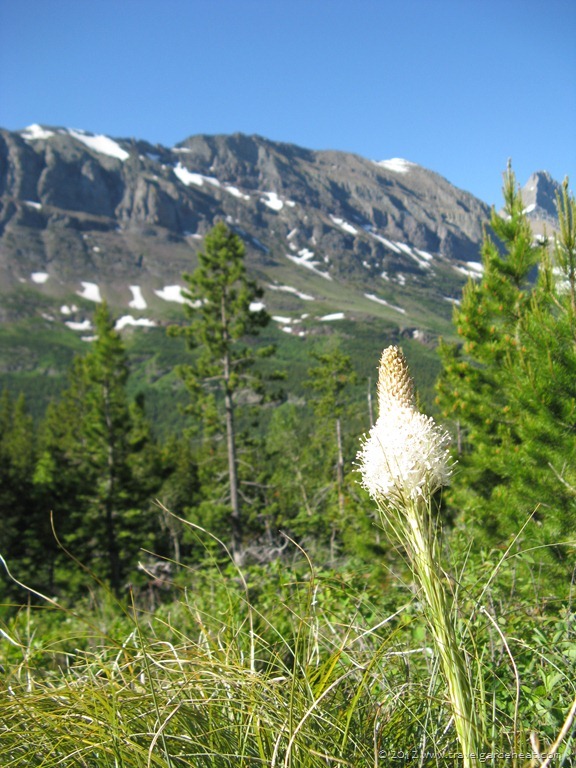 . . .It’s growth is luxouriant and continues green all winter but the horses will not eat it.” Meriwether Lewis collected a specimen of it during his journey, naming it beargrass, although no source I reviewed seemed to know the reason for the name. 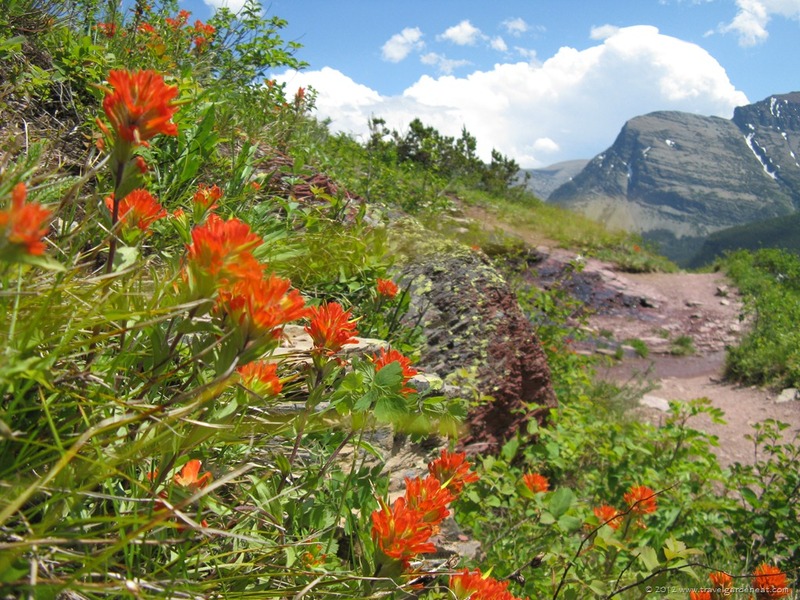 We visited the Park at the end of June, and the wildflowers were abundant along all of the trails and roadsides! 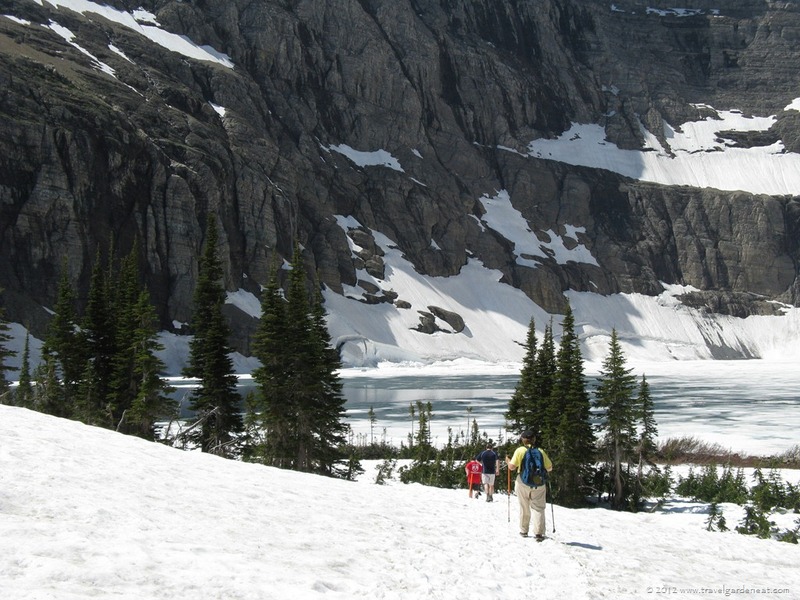 As we progressed along the trail, the full “amphitheater” of Iceberg Lake came into view. Truly awesome. Pictures cannot fully convey the wonder and magnitude of the curved mountain. In the valley far below the trail, we could see waterfalls created by the melting snow from the mountains high above. 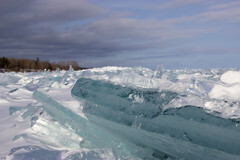 Iceberg Lake is known for its floating icebergs throughout much of the summer. Because we were visiting early in Glacier’s summer season, at the end of June, the Lake had only just started to melt, so there were no icebergs but only some open water surrounded by snow-covered trails and shoreline. We unpacked our bag lunches as we sat on the side of the lake. While we ate, we were delighted to see two groups of visitors making their way down the mountainside – mountain goats and bighorn sheep. With only the zoom on my point-and-shoot digital camera, I could not capture a quality shot of them. 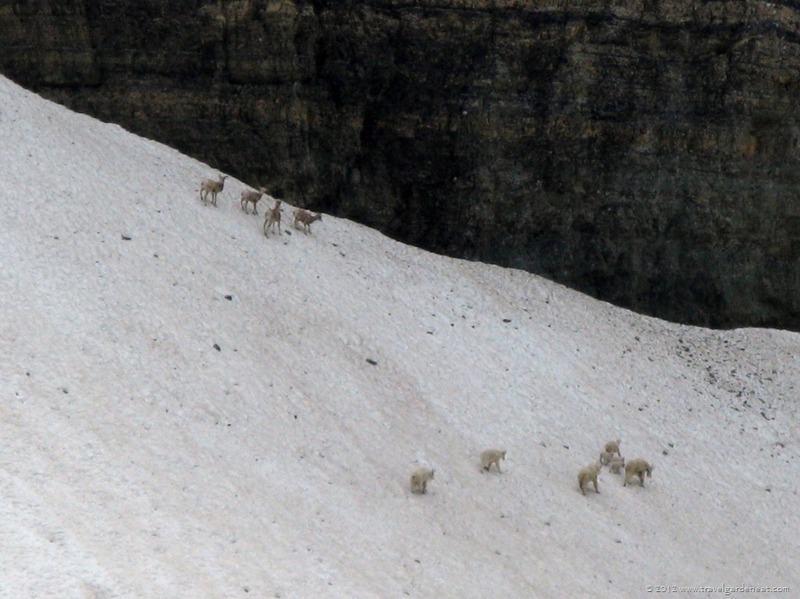 The nimble footing of the young mountain goats as they tumbled and played with each other on the steep embankment was so entertaining. After our leisurely lunch stop, we headed back on the trail again and followed the recommendation of the naturalist to refill our water bottles with snow (digging down several inches), providing ice-cold refreshment for the return trip. The return views were just as inspiring. 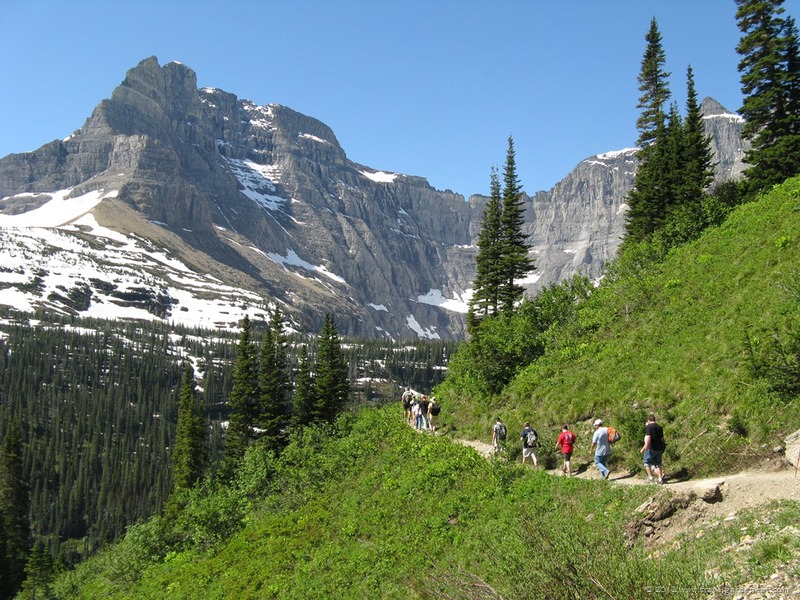 Particularly if you are hiking the Iceberg Lake Trail with a family, the naturalist-guided hike is very interesting and informative, without feeling too much like a “tour.” The National Park’s website for Glacier National Park provides a regular schedule of Ranger-led activities throughout the summer season. 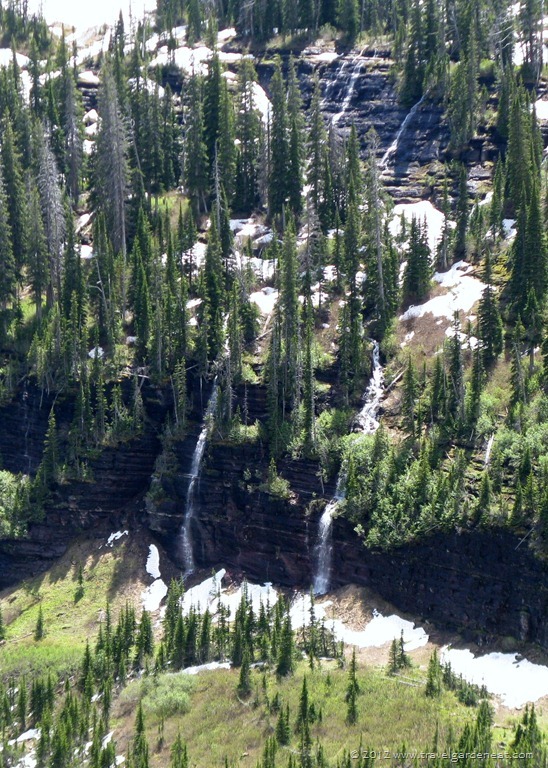 While the Iceberg Lake Trail hike does involve some elevation, it is gradual and nothing too strenuous. Pack a lunch to enjoy at the lakeshore, and make a day of it! (Just be sure to check the trail status reports for the day before you head out, and confirm the trail has not been closed due to grizzly activity!) It isn’t too early to begin planning next summer’s road trip!